Norman Rockwell Museum (NRM) is a resource for high-quality images of the objects in its collections. It provides 8″x10″ images scanned at 300dpi delivered over the internet (FTP). You may request custom sizes and resolutions for your order. The NRM reserves the right to evaluate each request. The NRM also reserves the right to charge fees and impose conditions above and beyond those listed in this Web site when deemed necessary. 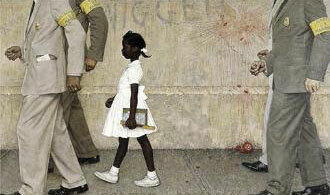 The NRM holds no copyrights for any works by Norman Rockwell. Clients are responsible for securing appropriate copyright permission. Materials will not be released without the written permission of the copyright holder. See Copyright Information below. To request images, download , fill out the online request form here . If you cannot fill out the form online, you may print it out and send it by mail to Image Services. You may also contact Image Services to request a form. Requests are processed in the order in which they are received. The length of time it takes to fill an order depends on its size, complexity, and whether copyright permission has been secured prior to the request being made. The processing of a rental agreement and invoice cannot begin until the Image Services Department of the Norman Rockwell Museum has received verification of copyright permission. Most orders are filled within 10 business days after all necessary paperwork has been received. Please note that the Norman Rockwell Museum is a not-for-profit institution, separate from the licensing companies that hold copyrights. Clients must negotiate copyright terms independently of the Museum. Fees paid to the copyright holder are exclusive of the rental fees charged by the NRM. Once all appropriate paperwork is in order, an agreement and invoice will be prepared. The agreement and invoice will be mailed shortly thereafter. Image Services must receive both the signed contracts and full pre-payment before any orders can be released. If you are inquiring about prints or collectibles, please visit the Museum Store. The Norman Rockwell Museum holds no copyrights for any works by Norman Rockwell. Clients are responsible for securing appropriate copyright permission. Once usage is approved in writing by the appropriate source; the Museum can release digital image files. Depending on the complexity of your request, you may have to contact more than one copyright holder. To determine which copyright holder you should contact, you will need to know which images you are interested in and exactly what their usage will be. If you have any questions, please contact Image Services, 413.931.2278, and we will be happy to assist you in determining the appropriate rights holder(s). Digital/electronic reproduction is defined as the rendering of images and/or words on a screen, monitor or other electronic device, where the information is stored on electronic media such as, but not limited to CD-ROM, computer disk, video or audio tape or disk, and the internet. Digital reproduction can be used in the following applications: Film, television, computer program, Web page, kiosk, electronic banner. Digital reproduction is subject to the following conditions. Your acceptance of these conditions is indicated by your payment of our invoice and signature on our Image Services Agreement. Print reproduction is defined as color or black and white images and text transferred in multiples to physical media such as, but not exclusive to, paper, cardboard, etc. Print reproduction is subject to the following conditions. Your acceptance of these conditions is indicated by your payment of our invoice and signature on our Rental Agreement. 1. Full credit line must appear exactly as specified by the The Norman Rockwell Museum (NRM), without editing, omissions, or use of acronyms. It must be placed in immediate proximity to the reproduction of the work(s) of art on the same display device. Note that this credit line is in addition to the credit line requested by the copyright holder. The designated credit line will be located on the Image Services Agreement. 2. Color depth must be at least 24 bits per pixel. Images must not be electronically stored in a size larger than 640 pixels in any dimension. Images must not be altered or distorted by methods such as but not limited to cropping, retouching, changing proportion, rotating, color effects, superimposing, animating, or captioning unless approved in advance by the copyright holder(s). Minor color corrections may be done without permission. A cropped detail may be used if the word DETAIL is added to the credit line. 3. Each image must be shown in the electronic document in its entirety, within a framed border, so that the image is not cropped by the edges of the viewable area. Nothing may be superimposed on the reproduction (i.e. lettering or another image). 4. The NRM reserves the right to deny use of images from its collection to any applicant. 5. Permission is granted for one-time use only for the specific purpose indicated. Any further reproductions will require a new request, written permission from the copyright holder and the NRM, and an additional fee. 6. Failure to pay the required fees means that permission cannot be granted. 7. Whereas the NRM owns no copyrights, written permission must be secured from the copyright holder(s) or their agent(s) before images can be released. In addition, the NRM assumes no responsibility for any royalties or fees claimed by the photographer or on his or her behalf. 8. Images will be released only to licensees who have express written permission from the copyright holder(s) for a specific, limited use and cannot be supplied to individuals or companies operating a photographic hire or sales service or copyright licensing services. 2. Each image must be reproduced unaltered and in its entirety unless approved in advance by the copyright holder(s). The reproduction must not be cropped, bled off the page, printed on color stock or with colored ink, nor have anything superimposed on the image. When a detail is used, the word DETAIL must appear in the credit line. 3. Full credit line must appear exactly as specified by the NRM, without editing, omissions or the use of acronyms. It must be located in immediate proximity to the reproduction of the work(s) of art, or in a location dedicated to photographic credits. Note that this credit line is in addition to the credit line requested by the copyright holder(s). The designated credit line will be located on the Image Services Agreement. 4. The Museum reserves the right to deny use of images from its collection to any applicant. 7. Whereas the NRM owns no copyrights, written permission must be secured from the copyright holder(s) or its agent(s) before images can be released. In addition, the NRM assumes no responsibility for any royalties or fees claimed by photographers or on their behalf. 8. Images will be released only to licensees who have the express written permission from the copyright holder(s) for a specific, limited use and cannot be supplied to individuals or companies operating a photographic hire or sales service or copyright licensing services. The Norman Rockwell Museum accepts payment by check, credit card, or wire transfer. We accept Visa, MasterCard, and American Express. Checks and wire transfers should be made out to “Norman Rockwell Museum”. For all wire transfers, $35 will be added to your total to cover bank fees. The Norman Rockwell Museum reserves the right to evaluate each request separately and to alter these fees according to the size and scope of the project. THE NORMAN ROCKWELL MUSEUM HOLDS NO COPYRIGHTS FOR ANY WORKS BY NORMAN ROCKWELL. CLIENTS ARE RESPONSIBLE FOR SECURING APPROPRIATE COPYRIGHT PERMISSION. NO MATERIALS WILL BE RELEASED WITHOUT THE WRITTEN PERMISSION OF THE COPYRIGHT HOLDER. If permission to reproduce has been secured at the time of this request, please send a copy of the signed form to imageservices@nrm.org. All photographic materials are shipped via Federal Express. If you have a FedEx account please fill in the information at A below. If you do not have a FedEx account, please follow the directions at B below. If a shipping option is not chosen, the Norman Rockwell Museum will invoice the client for 2nd Day FedEx delivery. All international orders please note, your shipments must be sent International Priority. I SUBMIT THE ABOVE INFORMATION FOR CONSIDERATION BY THE NORMAN ROCKWELL MUSEUM. I UNDERSTAND THAT I WILL BE CONTACTED BY THE MUSEUM AS SOON AS IT IS CONVENIENT TO PROCEED WITH THE RENTAL PROCESS. IF I DO NOT HEAR FROM THE MUSEUM SHORTLY, I WILL CONTACT THE MUSEUM TO CONFIRM RECEIPT OF THIS REQUEST FORM.